I am trying to build a house here and I need to cut back on the time I spend trying to help people via the internet. Many people make the same mistakes over and over, even though I have tried and tried to emphasize the important points to prevent this. So please read this first and I suggest reading the History next. It might save you a lot of time. Read my home page next and pay attention to the links. You may not want to read all of my pages, but please at least leaf through them and look at the pictures so you won’t be asking me about things that I have already shown. 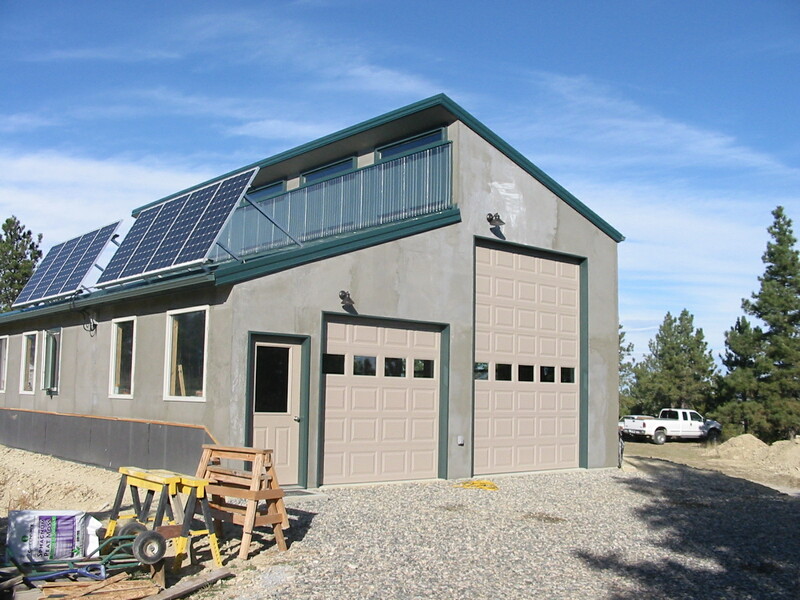 The best place I have found good information for everything solar is the Learning Center on the Backwoods Solar web site and the first part of their catalog. The NAWS outfit that I complain about also has good info on their web site if you can find it and are able to realize that the MPPT claims are inflated, even though they have gotten better. However, be very cautious in believing any advice you get from every solar dealer on the planet. There is too much of a profit motive involved in their selling the latest MPPT charge controller for them to really tell you the truth. I don’t care which dealer it is. Avoid forums unless you have the ability to see through those who think they know everything when they don’t. There ARE some dangerous folks out there. It never changes. This picture is our barn as of spring 2015. Our rig is parked inside of there for the winter. It is NOT a house and it is fireproofed with the first coat of stucco. All exterior trim is made of cement board. Funny, I just noticed the power cord coiled up on the driveway that I run over to the tractor when I need to plug her in and heat the diesel up so she will start. Wait, I can do that without a generator or a power line? You bet I can! The other picture is of the building inspectors checking out the house footings. 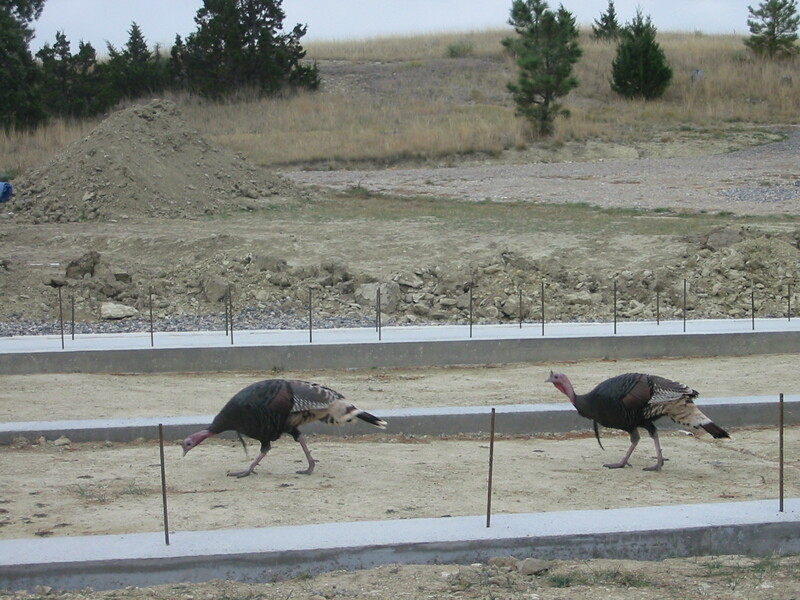 They were real turkeys… Very critical of my design. Walls go up soon. Yes, that footing in the background is 4ft wide for a solar heating Trombe wall. It is going to be a very unusual place. No power line or well and no wood stove either. We hope to buy just a bit of propane per year. Like everything else, I am reinventing the wheel at every turn and so far everything has worked as predicted. Read my 2014 page before asking if I will work on your system or if I will soon be in your area. We are staying in Montana and I am retired. We saw the whole country and decided where we wanted to live. We are happy here. A camper on our old truck is in our future, but not a full time RV. We’ve been living in a house on wheels for 15 years now. 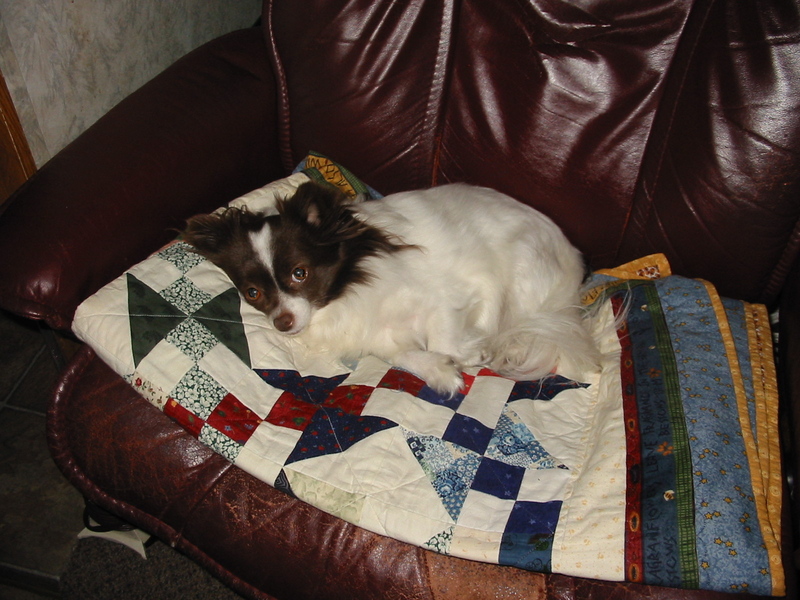 The quilter needs her sewing room and our two speed dog who is approaching three years of age needs more room to run where the coyotes, owls and mountain lions won’t get her. At just over 10lb we call her Maddie da Monster. 1. Is solar power for you? I cannot tell you and it isn’t for everybody. This is one place where you cannot just throw money at it and it will work. It is a waste to install solar power on an RV that spends most of it’s time plugged in. However, don’t spend a bunch of money on it if you are not willing to learn and do most of your own maintenance. Unless you have a home system that is built by somebody local, when you have a problem you will find it is not that easy to find anybody who can help you. Unfortunately even the home system installers still do not all know what they are doing. I’ve had people travel from several states away to have me look at their problems after they couldn’t find anyone who could help them and the local home systems I have seen around here have all needed help. It is pretty sad that many RV techs have no clue how electrical systems actually work, but it is true. One couple had nothing but a loose connection in the AC wires from their inverter and the two RV guys who looked at it both had no idea how to trouble shoot something that I figured out within five minutes. This doesn’t make me a genius, because electricity is really pretty basic. It means that many people just do not have the common sense to look for the obvious first instead of assuming the worst. 2. WIRE SIZES: My complaints about wire size started out in 2000, when every solar guy on the planet thought #10 was big. Stop taking this to mean that bigger is always better. It is NOT. Learn about how wires are sized for the amps they carry (the amps your solar panels actually produce, not the rating of the controller or the wires) and voltage drop is directly proportional to the amps and the length of the wire. You might Google ampacity chart or wire sizing. When people brag to me that they ran #2 for one or two panels I just want to scream. That is pure and simple waste. You CAN use #10 for small things, just not for big ones. As long as you get about 16V to the input terminals of a PWM controller it will work. MPPT does require bigger wires if you want it to work. Limit the voltage drop on the incoming wires to less than 2% for MPPT only. Read the directions for that inverter before asking me what cable size or fuse you need. You can ask your supplier, but don’t ask me. 3. BATTERY DIAGRAMS can be found on many web sites. I’m not about to repeat or try to improve on them. Equal lengths of cables between the batteries, not everywhere. Opposite corner positive & negative main connections are required if you want your batteries to be balanced but obviously they will not always be the same length. Look at the pictures I have elsewhere & this is obvious. I have been able to point at batteries in motor homes that were connected by factory experts and tell people which ones use more water than others. This imbalance is the cause of a lot of waste of money in our world and they deny that it is real. 4. TRIMETRIC: Read the directions. Everything needed to get a shunt connected right is repeated there more than once. Why RV guys cannot read it is beyond me, but stop asking why your meter is not showing all of the amps you use. It isn’t hooked up right and I don’t need pictures to tell me why. I have hooked up close to a hundred Trimetrics. I could do it in my sleep. Last, do not buy a Trimetric unless you are going to unplug from the grid and use your batteries. It is not a charging monitor… It is a battery monitor. When you are plugged in, it is just an expensive volt meter and if you don’t have good charging, it will never be accurate. 5. THE LATEST NEW THINGS: I will not address questions about new controllers or batteries. I know what has worked and I do not have the money to be experimenting. Experiment at your own risk. See if you can figure out if the controller you are looking at stays in absorption long enough to work or if the voltage is set correctly. I actually have looked at things that did not do what their marketing and specs claim, so you really need to be careful. The design of the PWM circuit does make a difference in how many amps will get into the batteries. Do you really think that a cheap Chinese circuit board is going to be as good as something from Morningstar, the company who has been doing this longer than anybody else? And by the way, Taiwan is not the same as mainland China. Morningstar is NOT made in China. Even that well respected German outfit has not figured out what to set the voltage at. The cheap Morningstar boards are potted for corrosion resistance. Does anybody else do this? The Trimetric SC2030 is even better at charging and I know this from personal experience, not from reading about it. Some of the biggest names in the business are still making things that do not work unless the rig is parked with nobody living in it. My message is not about that goal, so if that is what you want to do, you don’t need me. Virtually anything will do that. 6. BATTERIES: Cheap batteries are for rich people. (I actually stole that from a US military publication.) Failure never happens at the most opportune moment. Crown or Trojan, in that order. The rest are way down the list. One reason I say Crown is because of what they told me they find when they buy the competitor’s products and tear them apart. The offer was made for me to visit and look at the things in their lab. I wish they would publish pictures, but you know about our litigious society and what that would invite. The most popular brand got that way by marketing, delivering and taking defectives away for free, not by building an “outrageously reliable” product. When you go to Costco or Sam’s you are getting the low bidder for this year and that could be any brand. I hear from people who buy there due to the warranty, never considering the cost of travel or inconvenience, just like people who think the cost of running a generator is only the gas it uses. Buy AGM only if you cannot get at them for maintenance or cannot vent and then Life LIne or Concorde (the same thing) and as of April 2016 Crown is making AGM’s in the USA. Look for Crown 1. The truth is that AGM does not really last longer than a quality flooded battery, only longer than a cheap one. By the way, venting is an “over blown” issue. Worry more about the smell than danger from Hydrogen gas. Batteries used to be under the back seat in VW beetles. How many blow up? The side of one of those Chinese AGM batteries has an American Eagle and a flag on it. You can find mushy frozen “Alaskan” Salmon at Walmart that is marketed the same way. Look at the tiny print down in the corner (“product of China”). Poisoned dog food, baby food and lead paint is enough of a message for me. I hear that the Chinese are now cloning Morningstar products and the service load this is putting on the folks at Morningstar is causing issues. Those people have no scruples or ethics. It is high time that people in this country figure this out. They have hacked into our computers, fouled up satellites, on & on. What will it take for this country to wake up? I don’t want to blame the Chinese citizens; they are as much victims to their government as we are to ours. However, there seems to be a culture at work in China. Do I need to talk about others in today’s world? And please, Chinese made Lithium Ion batteries that cost three times as much as proven technology? Are you kidding me? The agenda there is profit and I don’t believe they are ready. I’ve been burned in the past by well respected manufacturers who decided to foist some new idea on an unsuspecting world without sufficient testing, so I am not buying it. Tell me after ten years or more. Added 2018: Stop believing that lead acid batteries cannot be run below 50% without damage. It is 20%, using 80% of capacity. Will we ever be delivered from all of the idjits on forums who just repeat everything they heard? 7. MPPT: You do need this if you are going to hook up panels that are designed for grid tie to a battery based system. The explanations can be found in many places and I don’t see why anybody should still miss this. PWM is same voltage out as in and can only be used for 36 cell (17-18Vmp) panels that are designed for 12V battery charging (or 72 cell panels on 24V systems.) Grid tie panels are NOT 24V and when a dealer tells you they are, he just told you how stupid he is. It is an epidemic… I have heard from people all over the US and Canada who had solar dealers try to tell them that a 60 cell panel is 24V. Ask him how you are going to get the 31V or higher equalizing voltage out of a 30V panel or even a decent charging voltage on a hot day when the panel will not do what it is rated at. 24V systems in RV’s are only for ridiculously over sized things. There is a place for it, but it rarely makes sense. Last, MPPT does not do anywhere what many people claim. Worse yet, the cheap ones are actually less efficient than a good PWM controller. I have proven this more than once and I am tired of trying to convince people. If a bit of extra charging early in the charge cycle will help you, fine. Just be realistic with your expectations and realize there is no magic “extra 25% and more”. I have explained this very well, so I won’t repeat myself. Go tell somebody who cares about the mistake you made in believing the outrageous marketing claims, especially by that outfit who specializes in MPPT RV charge controllers. Theirs do not do what is claimed. The word tracking means they should do that, varying what they do based on conditions. Guess what? Added 2018: Some people have been saying my info is dated and new MPPT controllers are available that I know nothing about. Wake up people… Those are the things I am talking about when I say that you can’t expect some cheap Chinese thing to outperform Morningstar. I have not looked at everything, but you need to ask a lot of questions and really think before believing anybody today. Somebody tried to tell me that a new $140 MPPT controller outperforms good PWM. That is impossible. Only by putting things up side by side and being able to switch back and forth could you see what I am talking about, but the latest and greatest $300 made in the USA MPPT controller does not work like a Tristar PWM does late in absorption and even the cheap little SC2030 is as good as a Tristar. How much heat a controller puts out when in absorption is a very good measure of how efficient it is. 8. POLY vs MONO PANELS: For an RV that isn’t going to last as long as the panels? It makes no difference. Mono panels are slightly more efficient (watts per square foot), and they may hold their efficiency longer, but who can prove that and does it really matter? Nope, dollars per amp is what is really important on RV systems. For home systems you need to look at the big picture, including the cost of mounting and wiring in order to come to a decision. A mounting rack can cost just as much as the panels it is holding with today’s lower panel prices. Last, you can parallel connect any panels that have similar voltage even if they are different watttages and the amps will add up. Our RV has three different brands and wattage’s of panels on it. They are all 36 cell panels, so they work just fine together. I keep hearing that professional solar dealers have this wrong and this is ridiculous. Do not series wire different wattage panels, but parallel wiring them is fine. I have even paralleled some flexible amorphous panels with higher voltage 36 cell panels. There, you will lose some of the amps that the lower voltage panels should produce, but some amps are better than none and it will not cause loss from the higher voltage panels. Remember, voltage is pressure. 9. FLEXIBLE PANELS: The amorphous panels do not produce enough voltage to work on large systems with any length of wire. They start out with a 16.5V rating and when they get hot, that drops (no matter what they claim). And shade tolerant just means they don’t get shut off by a small shadow. It still takes sunlight to make electricity and cloudy days give us anywhere from zero to 20% of sunny ones, no matter what kind of panels you have. This is sort of like the wind claims that I will address in #12 below. There are new 36 cell flexible panels that will work and I have been hearing good things, especially the lighter weight. April 2016… Oh oh, some flexible panels have caused fires and there is a recall going. Be careful. 10. PORTABLE PANELS: If the controller is on the back of the panel, it cannot work. If you put a controller at the wrong end of the wire it will not work due to voltage drop. That’s just the way it is and the people selling the things do not know. I even had one of them tell somebody that I was wrong and all car alternators are set below 14V. The guy doesn’t even own a volt meter! Put the controller at the battery end of the wire and it might work. A better controller will give you better charging. As I say in my puzzle, a blinking light on a controller that is remote from the batteries is no indication that the batteries are actually charged… Get a hydrometer. You can leave a controller connected to the batteries and just disconnect portable panels when moving. Landscape lighting wire is a good choice for this. All you need to do is make sure you get close to 16V to the controller and make sure that you cannot hook up with reverse polarity. However, I will never be a fan of the whole idea. Generators get up and walk away, so will panels. Panels hold up to hail very well, but not to being blown over onto rocks. Our truck has hail dents, but the solar panels protected the roof of the trailer on the day that all of our skylights were destroyed. Added June 2017: More and more people ask me about portable panels and I have one more thing to add… It is a bit difficult to arrive at your destination with a full battery if you travel with the solar panel disconnected. Even on a small trailer, one panel belongs on the roof. It could be a very small one for maintaining, but even 10 watts is not enough. Think… A frig control circuit takes more than than teeny panel can provide. Those panels are for things parked in the yard with already charged batteries and everything turned off. 11. HOW MUCH SOLAR POWER? Read my puzzle. Stop asking for a rule of thumb based on size of batteries and please stop assuming that more batteries is always better. It is not that simple. How much solar power you need has to be based on how much electricity you use, plus enough to take care of your batteries. And you cannot run any big loads like air conditioning or heating, so stop asking. OK, I will say that having around 6 to 8% of your C20 battery rating in charging amps will usually work, but you still need to figure out what the panels will put out in your climate and at the angle you mount them. Our home system is a bit over 8% and the RV has around 6%, after adding so we could run a freezer. When some fool on a forum tells you that you need 10 or 15%, stop reading. He probably works for a solar dealer. If you decide to add something like an electric freezer you will find out that your guess didn’t work anyway. How anybody expects somebody in Montana to be able to tell them what is needed with no load data or climate info is beyond me, but it happens all of the time. 12. WIND GENERATORS: I call them conversation generators because they make no sense on an RV unless it is parked at the beach in an off shore wind where there is nothing causing turbulence. Turbulence will destroy them over time due to gyroscopic load on the bearings. Read the specs. It takes WIND (not breeze) to make electricity and a 40ft pole is the minimum. I won’t even consider one for my home and we do get wind here. The trees are 80ft tall. Think about the cost of a 120ft tower, wiring and the fact that the wind is not constant. Think about the voltage drop in 200ft of wire. Most of them put up in the hills around here do not work at all. No kidding, I have seen 1000W wind turbines on 20ft poles, surrounded by trees and even downwind of a house or behind a solar array and even though it would spin, it put out nearly zero amps. The trouble is that just like in the solar world, most of the owners of them do not know. I added a meter to that one just to prove it to the owner. Now I just get mad. Solar panels are cheap in comparison. I saw a vertical axis turbine on a traffic signal pole one day that was way below all of the surrounding things that block the wind. That screams of marketing lies to me. Amps do not magically appear out of thin air. Wind or sun make energy and the lack of both equals no energy. I will still try to help as I have time. However, I will be getting short with people who don’t read first. So far I have not just deleted any email I received, but the time is coming. Well, all of you Chinese outfits who keep sending offers to sell me crap or asking for quotations go straight into spam. A few people who put me on their forwarding list for political crap or jokes ended up there also. I have issued one or two warnings, but that is all you will get. If you don’t get a reply from me, think about why that may be. Once you are in the spam filter, it is permanent.